My low coolant light blinks from time to time. I am not low on coolant and the car does not overheat. Please advise of what the problem may be. Low coolant light come on and stay on for about a mile driving then it goes out. The radiator is full of coolant. What caused the low coolant light to come on? A week ago my low coolant light came on. At first I did not understand what it is for. One night while driving my car started to run hot and it started to smoke. Somebody informed me that it was because of no antifreeze. A week prior to this my heat stopped working as well. So when I put the antifreeze in it started to leak. What could be the initial problem? I am hearing that it could be from a leak in my radiator, I might need a new thermostat, or something about my hoses. Can you please help me out if possible? What section of the engine area is the coolant leaking from? My coolant low light flashes for a while then as I ride it stays on. When I check it has enough in it, but the hose from the radiator is tight and the hose coming from the fan is also. The level sensor attached to the bottom of the coolant tank is probably faulty and sending false signal. Hi Gentlemen. The low coolant light just started staying on a week ago. Sometimes it also blinks intermittently. I never overheated it, but my daughter just used it and said it did not on her either. Coolant overflow is full, no apparent leaks, no sweet smell from exhaust. Please help. Thanks, Gordon Pittsburgh Pa.
Have you checked the sensor and its wiring? Should be near the top of the radiator. If you have an ohmmeter, you might check the sensor and replace if resistance is infinite. Low coolant light come on and stayed on for about one mile driving and then it went off? Could be faulty sensor. Or wires. Just replaced intake manifold gasket, radiator, water pump, thermostat and hoses. It keeps running hot and leaking antifreeze. Check engine light and low coolant light just popped on and to top it off my heater is blowing out cold air. Where is it leaking antifreeze from? Sounds like that leak needs to be fixed. Heater blowing cold air is probably due to no or low coolant. Check your heater hoses and check also inside of cab. 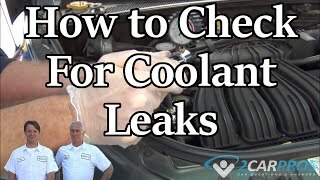 Start to check all coolant lines from radiator to radiator. When you change parts I think you forgot to connect one coolant hose. It is leaking coolant under the alternator area. Water pump is somewhat below the alternator. Okay, got the leak fixed. It was the timing cover gasket. Interesting. Glad to know it has been fixed. 2001 Chevy Lumina Security Light ?